The SpheronLite solution enables a spheron camera & 3d laser scanner combination workflow. It creates the ultimate HDR spherical colour for a 3d point cloud data set. Spheron offers the most accurate spherical HDR imagery, as its camera head rotates around the absolute nodal center position. Requiring no image-stitching or blending, the HDR data is captured automatically in one single rotation, resulting in a perfect image with no parallax image distortion issues. parallax-effects between laser-geometry and camera-colour is minimized by two dedicated precision-mounts, which ensure perfect alignment between the nodal point of the laser-scanner and the camera. the colour-image itself is captured in one precise, continuous rotation around the cameras lens-nodal-point, resulting in a geometrically accurate, crisp sharp and highest resolution image: actually up to more than 100 MPixel (when comparing to a DSLR) and in best HDR image quality – offering an outstanding 26 f-stops of dynamic range. the color image is therefore generated from ground truth data and without any guessing of a reprojection-distance: artefacts generated by missing geometry (from e.g. non-cooperating surfaces, etc.) are hence fully avoided. The solution consists of a SceneCam® camera device for full spherical HDR imaging. Its operated from a lightweight touchscreen tablet which attaches directly to any survey tripod. 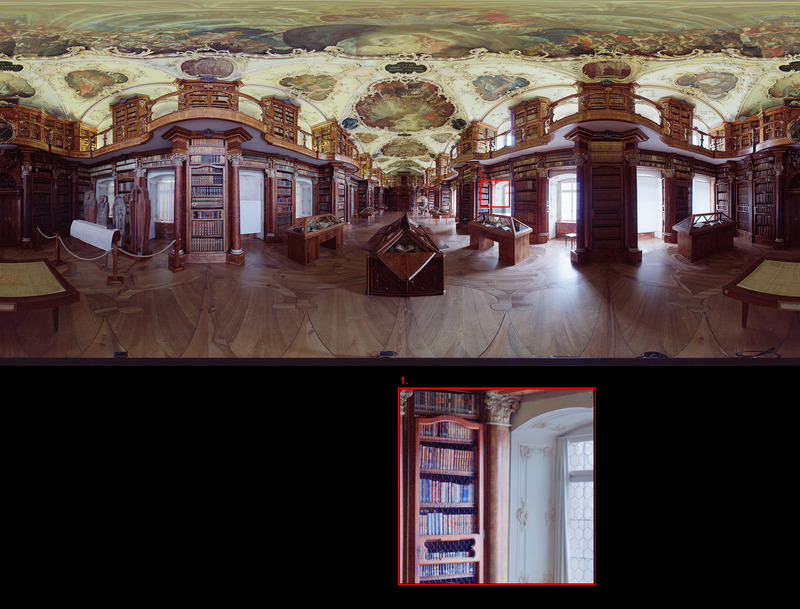 With one single rotation around the vertical axis the camera scans the complete scene from ‘floor to ceiling’. High dynamic range imaging with the SceneCam® is about capturing all levels of light in a scene: from the darkest shadows to the brightest sunlight all in one scan. The new tribrach tripod adapter heads allows the Spheron camera lens to be positioned at the same height as a terrestrial laser scanner unit. Spheron offers the most accurate spherical imagery, as its camera head rotates around the absolute nodal center position. Requiring no image stitching, the data is captured automatically in one single rotation, resulting in a perfect image with no parallax image distortion issues. Resolution - SceneCam® resolution of 100 megapixels (full spherical image @ DSLR fill-factor). Optics - Fisheye Lens (Nikon 16mm f/2.8D).Individually calibrated for the compensation of spherical distortion, vignetting and chromatic aberration. Providing unlimited view 360° x 180°. Tripod - Custom designed tripod attachment arm with integrated touchscreen / battery holders, easily mounted onto any survey style tripod. A tribrach adapter is also included allowing a laser device to be height matched to a SceneCam. Camera operation - Intuitive one-click touchscreen SceneCam® operation software presented on a lightweight 10’’ touchscreen tablet. Operating time - SceneCam® operates more than 8 hours with one battery pack. * Spheron offers tribrach adapter mounts for a range of different laser scanners, for more details contact us directly with your specific requirements. All SpheronLite systems are ScanLight compatible, allowing customers the opportunity to upgrade to the benefit of the ScanLight attachment. Providing the perfect illumination even in complete darkness. ScanLight is a powerful lighting solution for perfect illumination on scene – providing complete independence from actual light conditions. It attaches directly to the camera’s sensor head. During the scan, the ScanLight rotates together with the SceneCam® around the vertical axis, while its precisely focused quad-column LED array illuminates almost only the actual scanning direction. As a result, valuable battery power is saved and mobile operation time is increased. SpheronLite tribrach adapters are now available for the Leica Geosystems High-Definition Scanning (HDS) product range including ScanStations C10, P15, P16, P20, P30, P40. Now offering a fully integrated workflow of SpheronLITE HDR image data directly into Leica Geosystems 3d point cloud post processing software - Cyclone. SpheronLite is now available directly from Leica Geosystems in all regions globally. For details please contact your local Leica Geosystems office or authorised dealer.